Stay up-to-date on approaching storms or post storm activities by signing up for our Press Release. Click Press Release (above) for larger view. 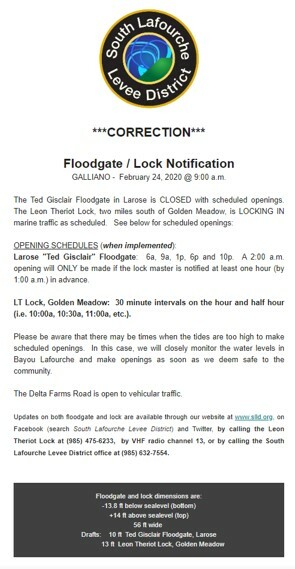 NOTE: The below times do not apply when a total closure (no foreseeable openings are scheduled) is observed. CLICK THE PRESS RELEASE BELOW FOR LARGER VIEW. Please be aware that whenever high tides occur, either or both floodgates may close at any time without notice. 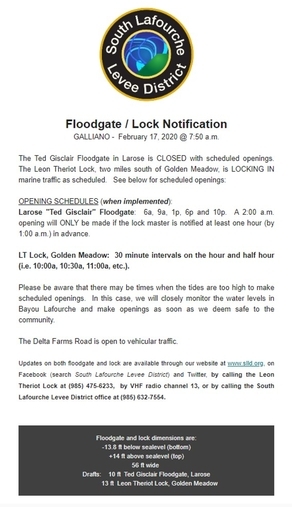 Updates on both floodgates may be obtained through our website at www.slld.org, by calling the Lock in Golden Meadow at (985) 475-6233, or the South Lafourche Levee District office at (985) 632-7554. Stay updated. Follow us on Twitter and Facebook.